The culmination of all my Pinterest dreams ^^ Only 11 months since I got my shelves built into my alcoves and they’re pretty much finished, and I am SO in love. Despite living in a Georgian property, when I moved in it had just been refurbished so it was pretty much an open book for me in terms of decorating. I had actually decided the first time I viewed the property (before even putting in an offer might I add, yeh I’m extra) that I wanted shelves built into the alcoves in the living room and bedroom. 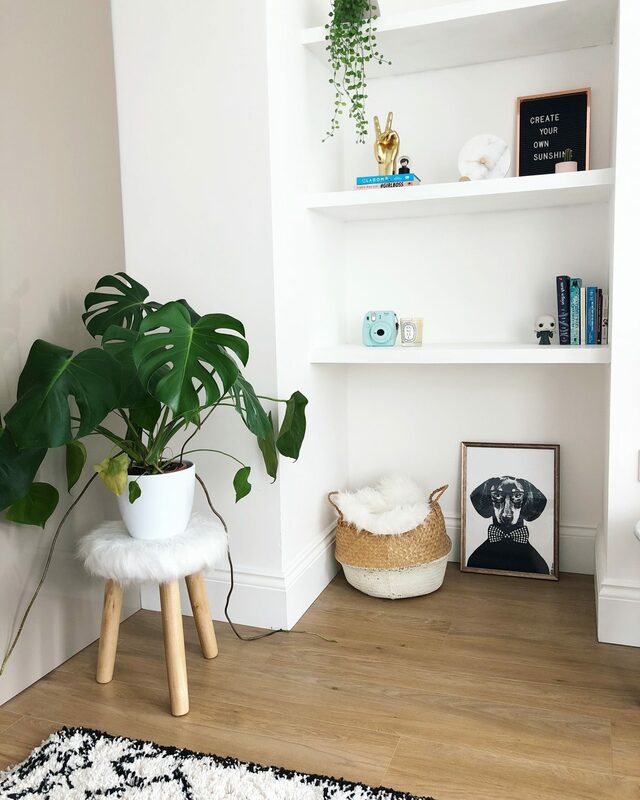 Alcoves are a completely dead space, and it looks so much more flush and perfect than putting in a set of shelves as you’ll struggle to find anything that will fit the space exactly. With such high ceilings, it really was the best option for me. You *probably* could do this yourself, but hey I haven’t even been able to put prints up on my walls 18 months later because I don’t know how lol. If you’re in the South West area I had Drew Dyer Carpentry craft the shelves for me and I could not have been happier with the finish – it truly is worth spending the money for quality if you want something that isn’t going to need redoing in 10 years. After 4 coats of white paint, and 2 days later, they were ready for styling. The shelves have become my favourite part in my home, and I’m super excited to style them for Christmas. So we’ve all seen the perfectly put together shelfies on Pinterest, but how can we create them with the stuff we may or may not already have? Welcome to my shelfie masterclass! The way your home looks will dictate to a certain extent how your shelves will look which means that you might have to consider a theme or a certain colour scheme. As my home is completely white it has enabled me to furnish with soft pops of colours. And if you’re wondering, there is no such thing as TOO MUCH copper, you heard it here first. Deciding the colour scheme and theme is your first step to being able to start buying and styling your shelves. I would also highly recommend pinning lots of shelfie inspo on Pinterest beforehand as it really helps you narrow down what things you do and don’t like. When you have lots of empty shelves to fill and only a few bits to start with it can be really daunting! This is partially why it has taken me so long to finish styling them (and I still have the very top shelf to fill!). I didn’t know where to start basically so I just ended up adding little bits at a time, and there really isn’t anything wrong with that. My best bit of advice would be to start with your largest items, as they will become the main focus of that shelf. You can then get a better idea of what pieces would complement it, and most importantly work with it. I did this with the glass dome, the Lightbox and the gold peace hand. I then built around these pieces, removed and rearranged until I was happy. There is no time limit on styling your shelves, playing around and seeing what looks ‘right’ is the best part, enjoy it! Mixing up the placement of items is really important, having items going in different directions really adds an element of interest to your shelves. Let’s face it, simple is boring, huh? I have done this with the way that I stack books on alternate shelves and by featuring prints and objects that lie flat on the shelf such as the clock, the shoes and the bag. It really starts to become a visual feast for the eyes when there is lots of different things happenin’. Adding a little bit of greenery is a must have essential, preferably fake. No maintenance required. Trailing plants add such a quirky element and they are an obvious hit with Insta. Cacti, terrariums and any other small plants add a pop of colour, especially if you use patterned planters. It also helps to add height variation too as rule no 13647 of creating a perfect shelfie is that you definitely don’t want everything to be the same height. Over styling and adding too many elements might seem like a good idea but it will make the space crowded and in turn look smaller than the space actually is. As you can see on my shelves I leave a similar amount of room between objects on each shelf and I never feature more than 3 main items per shelf. It totally depends on the width of your shelves too, mine are fairly wide so I find the standard 3 items across makes it symmetrical whilst creating the perfect breathing room between the other items. Unless you’re going for a monochromatic style then adding some pops of colour is an absolute must, especially if your home is predominantly white. Colour, sparkle and reflection is what attracts the eyes and I feature a lot of colour on my shelves, mostly pastels of course. This can be done simply by just using colourful coffee table books, greenery and ornaments. Don’t be too shy when it comes to the colour element, if you personally like the colour DO IT. An optional extra, I find prints, letter boards and light boxes an amazing addition to shelves. They’re fun, can be mixed up with different messages as the seasons and weeks change and it means your shelves don’t become outdated as they’re contrasty being refreshed (that’s if you don’t forget to change the message for months like me, oops). Prints are fun too because of the colour element and I always go for slogan prints or a quote that means something to me. Shelves are a sure fire way to add your personality to your home and you can be as creative as you want. When it comes to styling shelves, practice really does make perfect, it certainly took me a lot of swapping things around and buying new pieces to find something I really liked the look of, and I’m still not finished by any means! There are no rules when it comes to creating YOUR perfect shelves but the above will give you a little direction as I know how daunting staring a set of plain shelves and creating the image of what they should look like in your head is. It’s like trying to decide your work outfit the night before in your head, you never come up with anything! Simply pick your favourite pieces and go from there. 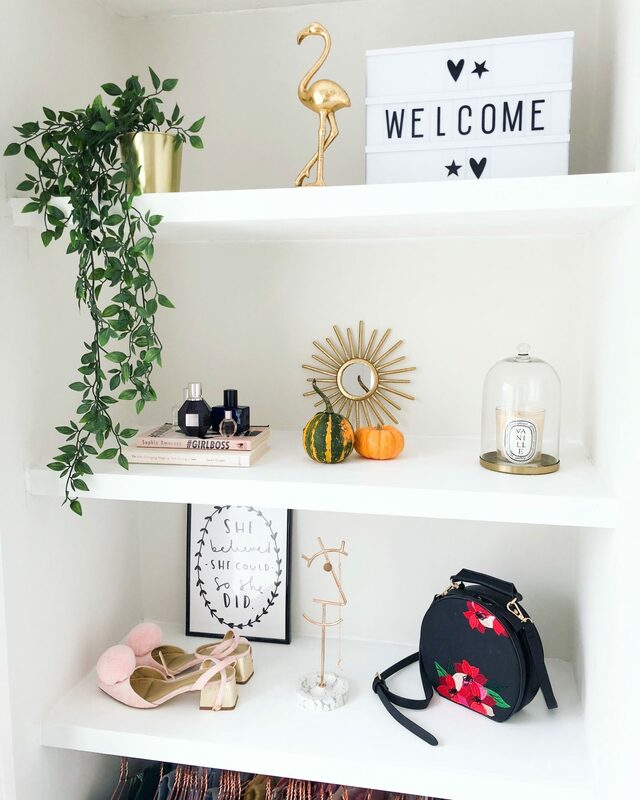 Styling shelves is so much fun, and provides bloody good content for the gram every time you do a restyle. Who wants to see a Christmas styling of my shelves?